Technology giant Microsoft has announced that Satya Nadella will be its next chief executive.Satya Nadella is the new Chief Executive Officer of Microsoft. Satya was appointed CEO on February 4, 2014, succeeding Steve Ballmer. Previously, he was executive vice president of Microsoft’s Cloud and Enterprise group, responsible for building and running the company’s computing platforms, developer tools and cloud services. Satya Nadella was born in Hyderabad, Andhra Pradesh, India to an IAS officer, B. N. Yugandhar, hailing from Guntur District. who was a member of the Planning Commission during 2004–2009 under Prime Minister Manmohan Singh. 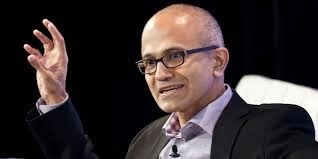 Satya Nadella attended the Hyderabad Public School in Begumpet before attaining a Bachelor of Engineering in Electrical and electronics degree from Manipal Institute of Technology, Manipal, Karnataka. 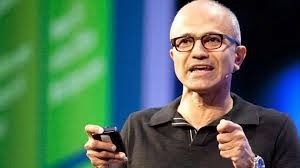 After moving to the US, Satya Nadella earned an MS in Computer Science from the University of Wisconsin–Milwaukee and an MBA from the University of Chicago Booth School of Business. Satya Nadella worked with Sun Microsystems, as a member of its technology staff, prior to joining Microsoft in 1992. The company was building an operating system that ultimately would be known as Windows NT, and needed team members who understood Unix and 32-bit operating systems, he says. Nadella wanted to complete his master’s degree and take the Microsoft job. He did both. Nadella worked as the senior vice president of R&D for the Online Services Division and vice president of the Microsoft Business Division. Later, he was made the president of Microsoft’s $19 billion Server and Tools Business and led a transformation of the company's business and technology culture from client services to cloud infrastructure and services. He has been credited for bringing Microsoft's database, Windows Server and developer tools to its Azure cloud. The revenue from Cloud Services grew to $20.3 billion in June 2013 from $16.6 billion when he took over in 2011. Nadella's base salary is nearly $6.7 million (plus stock bonuses), which adds upto $7.6 million. This is just for 2013 and will inevitably shoot up as the years pass by. On January 30, 2014, news reports started surfacing that he was the frontrunner to succeed Steve Ballmer as the chief executive officer (CEO) of Microsoft. On February 4, 2014, Nadella was announced as the new CEO of Microsoft. He becomes only the third chief executive in the company's history.